Should the Knicks Draft Jimmer Fredette? 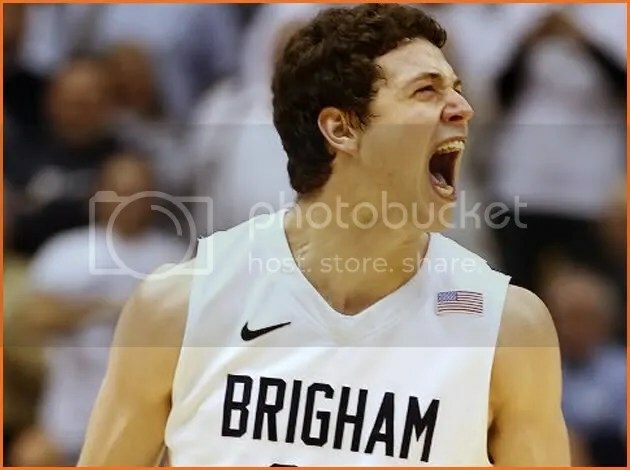 With the 17th pick in this months NBA draft, it’s been widely rumored that the Knicks are in love with BYU scoring phenomenon and Glens Falls native Jimmer Fredette. There’s no question that he’s a lights out shooter but is he the right fit for the Knicks? I do not believe so. With 1 draft selection (17 in the first round) in this years draft and 0 selections in next years draft, I believe the Knicks need to hit a grand slam with this pick. With Miami in their way in the eastern conference, the Knicks do not have time to wait around for a project guard who may be better suited as a 2 guard. If we had no holes and were picking based on best available talent then I could accept a Fredette selection at number 17 but that is not the situation we are in. The Knicks lack serious bench depth, a backup point guard and a defensive minded center. While Fredette could help add to our bench, I believe he’s better suited as a 2 guard as he’s not a great passer. While typically Mike D’Antoni’s “seven seconds or less offense” would fit nicely with Fredette’s style of play, the Knicks offense right now is in transition to a slower pace with isolation monsters Carmelo Anthony and Amare Stoudemire and veteran point guard Chauncey Billups. Our point guard needs to be able to play off the ball and create shots when open from all spots on the court. While Fredette has the ability to make shots, we all know he has a great jumper, I am not sure how he will adjust to a change where he’s at best the 4th option. He’s not going to have any games like at BYU where he took 30 shots. He will be a 5-12 shot a game guy and he needs to be able to efficiently score. He was a volume scorer at BYU and obviously he’s not going to have the same freedoms in New York. My main problem with Jimmer is that if his offense doesn’t pan out, he has no defensive game to fall back on. He was an atrocious defender at BYU and that was with a lot of zone defense being played. He has reportedly been working hard to improve his defense in the offseason but you never know how much one can improve with one offseason. With the current roster that we have, I do not believe we need another high volume scorer who’s deficient on defense. While Jimmer has a lot of potential and could pay miraculous dividends, he also comes with a lot of bust potential. It’s not that I do not believe Jimmer can be a good player but with the roster and cap situation that we currently have, we just don’t have the time to wait on him to see if he’ll pan out. We need a player that can start impacting games from game 1. There’s no doubting while there is optimism in New York there is also a great amount of desperation. We have not won a playoff game since 2000 and the fans want results. We cannot afford to swing and miss with this draft pick and if we miss with Fredette, his lack of defensive effectiveness could be catastrophic to the team.